How did the Bald Eagle become our National Symbol? The Second Continental Congress selected the Bald Eagle as the U. S. National Symbol on June 20, 1782. Shortly after the Declaration of Independence was signed on July 4, 1776, the Continental Congress asked Benjamin Franklin, Thomas Jefferson, and John Adams to design an official seal for the new nation. They were unable to come up with a satisfactory design, so a second, then a third committee was assigned the same task. None were successful, although each had some ideas. The Continental Congress then handed the task to Charles Thompson, secretary of Congress. He took what he thought were the best parts of the designs that had already been submitted, and came up with the design we use today. A small white eagle had been part of the third committee’s design. Thompson changed that to be a much more majestic Bald Eagle. His design was accepted. There is no truth to the oft-quoted statement that Benjamin Franklin lobbied Congress to get the turkey approved as our national emblem. Where does our National Symbol appear? The Bald Eagle appears on official documents, currency, flags, public buildings and other government-related items. It is used in the military and by government agencies. What makes the Bald Eagle a good symbol for our country? 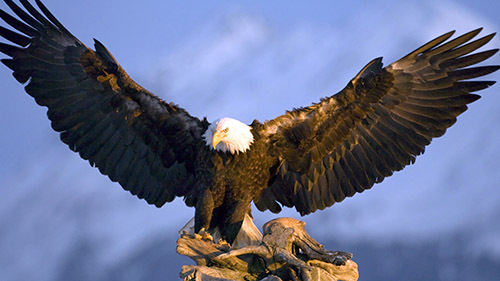 They are unique to North America, making them ‘our’ eagle; they are strong and independent; they are survivors. They are majestic, bold, and faithful. They are a symbol of strength and determination. Explain the symbolism in the National Seal. This symbol of sovereignty was adopted on June 20, 1782 by the Second Continental Congress. Its imagery was finalized by Secretary of Congress Charles Thomson from design suggestions by Thomas Jefferson, John Adams, and Benjamin Franklin — plus contributions from two other committees and from Thomson, who chose the American Bald Eagle as the centerpiece of the Great Seal. Charles Thomson’s remarks about the symbolism: The Escutcheon [shield] is composed of the chief & pale, the two most honorable ordinaries. The Pieces, paly, represent the several states all joined in one solid compact entire, supporting a Chief, which unites the whole & represents Congress. The Motto alludes to this union. The pales in the arms are kept closely united by the chief and the Chief depends upon that union & the strength resulting from it for its support, to denote the Confederacy of the United States of America & the preservation of their union through Congress. The colours of the pales are those used in the flag of the United States of America; White signifies purity and innocence, Red, hardiness & valor, and Blue, the colour of the Chief signifies vigilance, perseverance & justice. The Olive branch and arrows denote the power of peace & war which is exclusively vested in Congress. The Constellation denotes a new State taking its place and rank among other sovereign powers. The Escutcheon is born on the breast of an American Eagle without any other supporters to denote that the United States of America ought to rely on their own Virtue. When one receives an Eagle feather, that person is being acknowledged with gratitude, love and ultimate respect. The holder of the feather must ensure that anything that changes one’s state of mind (alcohol and drugs) must never come in contact with a sacred Eagle feather. The keeper of an Eagle feather makes a little home where the feather will be kept safely and protected. It should be hung up within one’s home, not placed in drawers or cupboards. Eagle feathers are never to be abused, shown disrespect, dropped or contaminated. Only real true human Men and Women carry the Eagle feather. Many dancers use Eagle feathers as part of their dance regalia. The Creek and Cherokee have an Eagle Dance. If for any reason an eagle feather is dropped, it needs to be cleansed. The arena director’s job is to guard the Eagle feather and not leave the spot it is in until the proper cleansing ceremony is performed. Eagle feathers were awarded to Indian Braves, warriors and Chieftains for extreme acts of valor and bravery. These feathers were difficult to come by, and were earned one at a time. Regardless of where or how an Indian Brave accumulated Eagle feathers, he was not allowed, according to Tribal Law, to wear them until he won them by a brave deed. He had to appear before the Tribal Council and tell or reenact his exploit. Witnesses were examined and, if in the eyes of the council, the deed was thought worthy, the Indian Brave was then allowed to wear the feathers in his hair or Indian Headdress or Indian War Bonnet. An Indian would rather part with his horse or tepee, than to lose his Eagle feathers. To do so would be dishonor in the eyes of his Tribe. Many of the old American Indian Chiefs had won enough honors to wear a double-trailed bonnet that dragged the ground. Only the great and important men of the Tribes had the right to wear the double-trailed Indian War Bonnets. During the “Four Sacred Rituals”, American Indians wear or hold Eagle feathers. The “Flag Song” has its earliest origins during the period when some Indian Nations would honor the Eagle feather staffs of leaders from different other bands of Indian Nations. Under both U.S. and Canadian law, a permit is required from official governmental conservation authorities of anyone to possess an Eagle feather legally. Native American Indians acquiring Bald and Golden Eagle feathers must use them for traditional ceremonies or teaching purposes. Under normal circumstances, it is illegal to use, sell or possess Eagle feathers. Anyone possessing an Eagle feather without a federal permit can face stiff fines and imprisonment. The American Indian holds the Eagle in the highest regard, and has a true “heart and soul desire” to keep it flying healthy and free for many generations to come.